2. German rock guitarist and songwriter from Irhove, Leer, Germany. 1. Carl Carlton (b. 1953) is an American R&B, soul, and funk singer and songwriter best known for his hits "Everlasting Love" and "She's a Bad Mama Jama (She's Built, She's Stacked)". Carlton, born in Detroit, Michigan, first began recording in the late 1960's as "Little Carl" Carlton, a likely marketing ploy to capitalize on some vocal similarities to established hitmaker Stevie Wonder, who also hails from Detroit and had recorded under the name "Little Stevie" Wonder in the early 60's. After scoring some minor local hits, Carlton was signed by Don D. Robey and moved to Houston, Texas, the home of his new record label, Back Beat Records. Carlton saw some success with the new label including his first major hit, a disco-tinged remake of Robert Knight's "Everlasting Love" that went to #6 on the U.S. pop music charts. Robey sold his labels to ABC Records in 1972, and in 1976 Carlton became embroiled in a royalty dispute with the new ownership that caused him to stop recording for some time. He then signed with Mercury Records in 1977, but only released one single on that label. Carlton was unable to land a new record deal for several years until Leon Haywood helped him get a singles deal with 20th Century Records. A Haywood-penned single, "She's a Bad Mama Jama", became a major hit, peaking at #2 on the pop charts and earning Carlton a Grammy Award nomination for Best R&B Vocal Performance, Male. 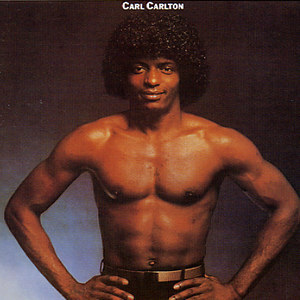 Carlton's subsequent album, Carl Carlton, went gold in 1981. "She's a Bad Mama Jama" has since become a staple of compilation albums and soundtracks and is often sampled in rap music. Carlton released several more albums in the 80's but had only a few minor R&B hits, and eventually fell out of favor with record companies and out of the public eye. After 1985's Private Property, he did not release another album until 1994's Main Event, which failed to chart. In late 2002, Carlton appeared with many R&B superstars on the "Rhythm, Love, and Soul" edition of the PBS series American Soundtrack. His performance of "Everlasting Love" was included on the accompanying live album that was released in 2004. 2. His current band project is called Carl Carlton and the Songdogs.